The following is from a trip to the cities of ChengDu 成都 & MianYang 绵阳 in Sichuan province 四川省, China 中国. Here’s the view I see each morning from the Kempinski Hotel. ChengDu is interlaced with lots of “flyovers”, and it’s the only way of getting around this sprawling capital city with any speed at all. Here’s the same vantage point, seen just before I go to bed. There’s a lot of traffic, but nothing as compared to Mexico City. Things here might be slow, but they plod along. 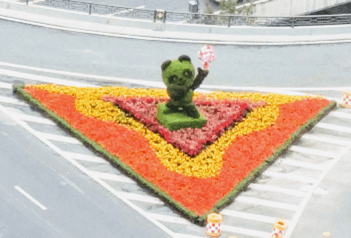 Zooming into one of the flyover corners, to the decorative flower planters, you see a bush sculpted into the shape of a panda, which appears on logos everywhere; pandas are native to this part of the province. While we’re in the hotel room, a moment about the in-room television channels: almost all of them are Chinese, but a few are in English, and at least one in German. The funny thing (for me, at least) is their choice of things to carry and dub. 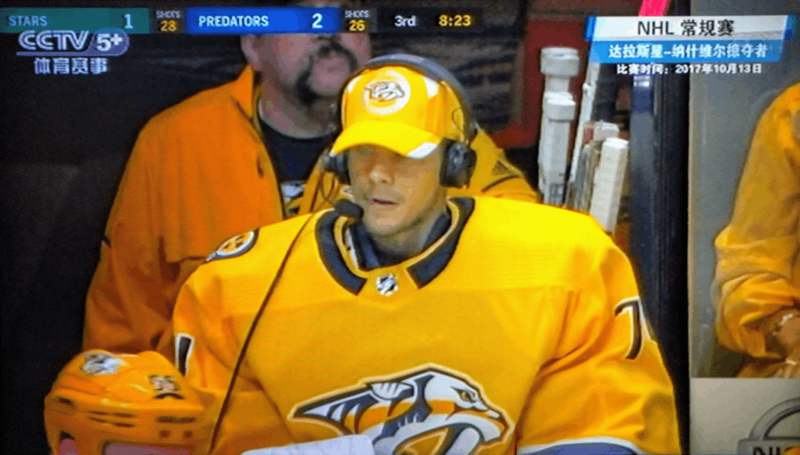 Tonight I was watching an NHL game. The writing on the screen was Chinese, but the voiceover commentary was in Russian. No Don Cherry here! I did have a happy flashback to the many Oilers games I’ve attended. 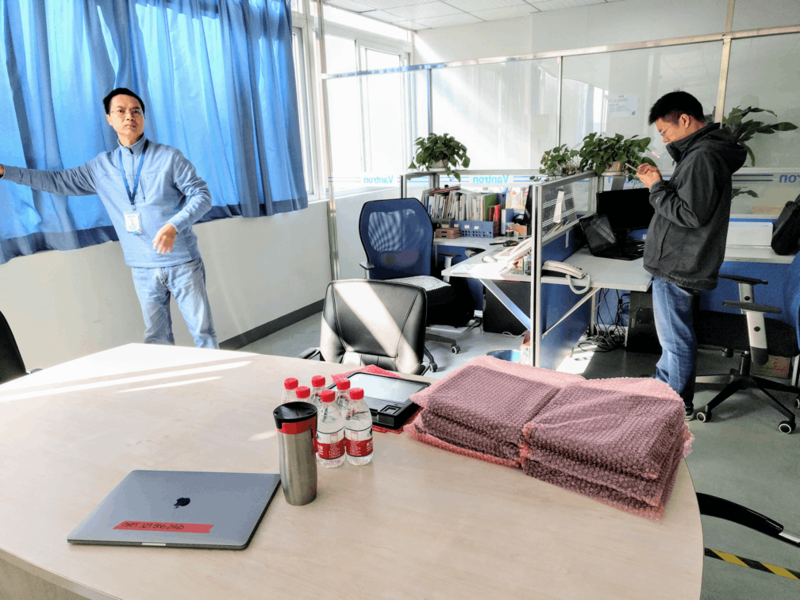 Some of my work takes place in ChengDu, at the Vantron offices. So let’s move there, since this is what takes up my days. Here are CY (left) and Alvin, two senior engineers. These are the guys who run this project production, and a lot of last week was me negotiating between our company and these guys. They hate saying ‘no’, and they hate committing to anything, so there’s a lot of ‘maybe’ in conversations. I’ve learned how to get around that when we really need something. 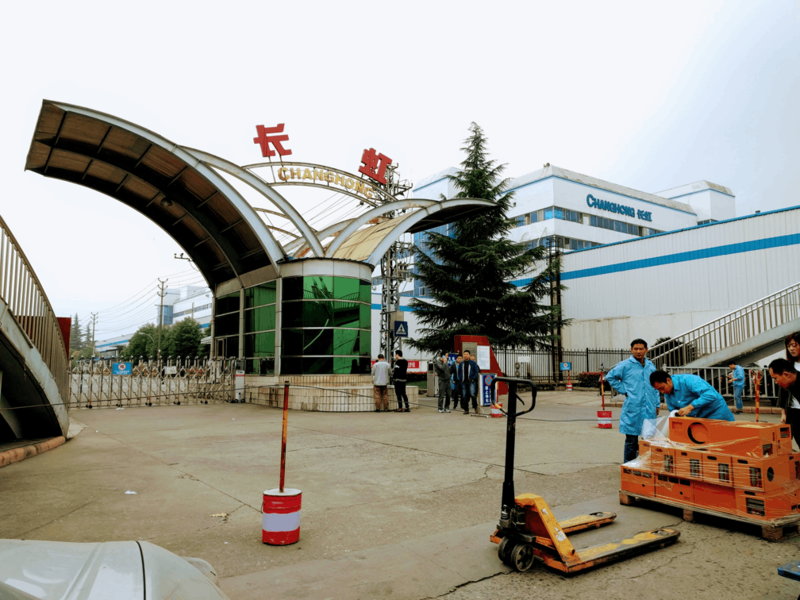 The serious work of building hardware is done 135 km away, in the city of MingYang, at Changhong, a contract manufacturer. The first thing is the striking entrance. It’s got this Golden Era of NASA vibe to it. What’s that futuristic Disney space area? CH would fit in perfectly there :-) You can lose yourself for hours in the deep green glass itself; it’s hypnotic. 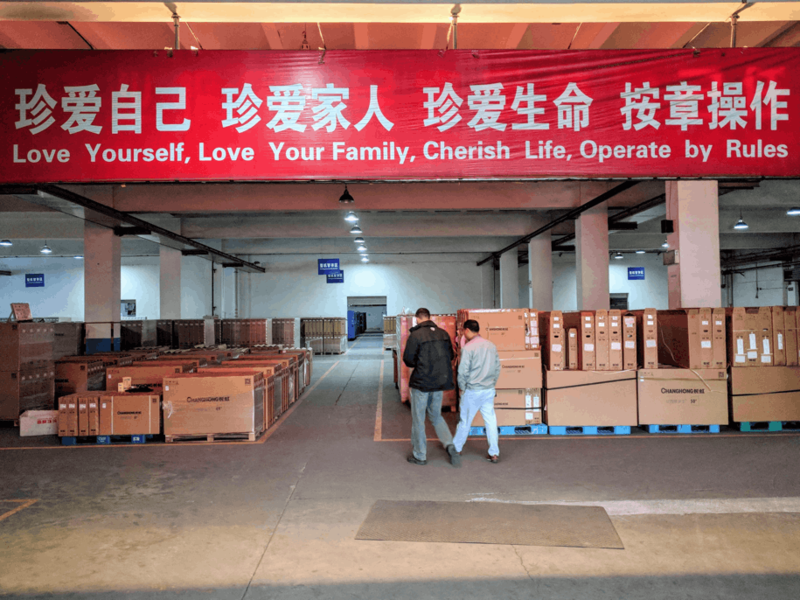 We walk under the most Chinese of exhortations. I love the last clause. It’s nice to start the day with a chuckle and pep in my step. Walking under the banner are Mr Liang and Mr Lee, who take turns running the assembly line. 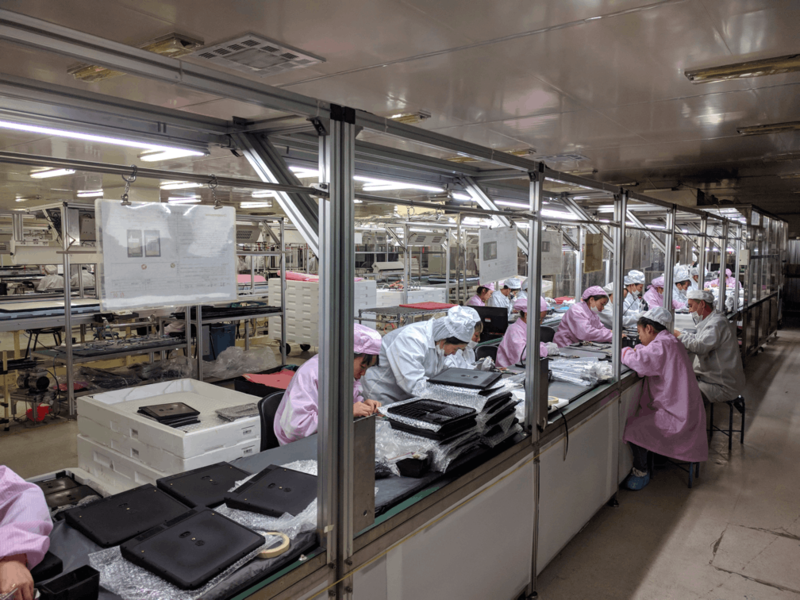 As we stroll through the cavernous building, where pretty much every consumer electronics device you’ve ever touched was built (by hand), we can see assembly lines to our left and right. 50″ flat-panel TVs, fridges, and dishwashers, it’s all here. 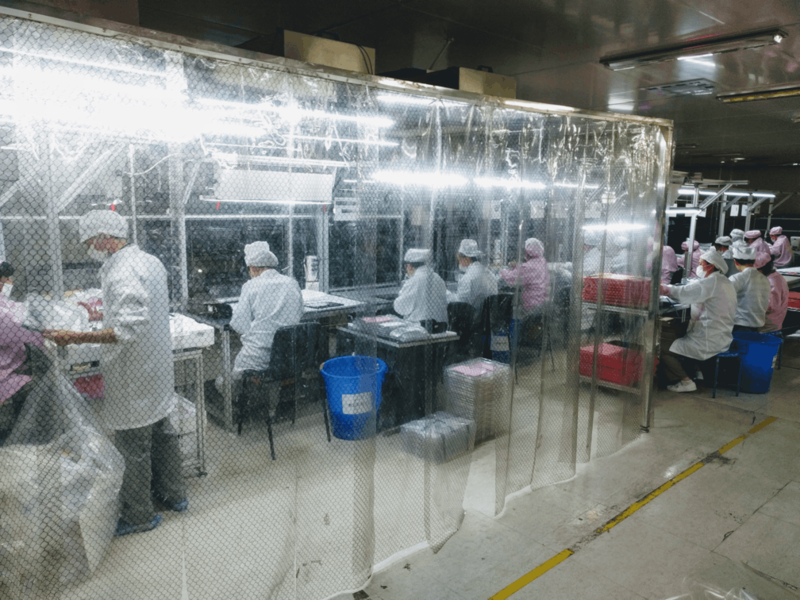 This is our assembly line, with the beginning furthest away from us, and the finished product coming out at this end. Taping, soldering, screwing, there are a hundred little subtle things that convert a huge manifest of parts into a working custom Android tablet. Like most factories, there’s a caste system here. The assemblers never interact with the managers, unless they’re told to do something (or something different). During lunch they run out, grabbing bucket-sized thermos containers that keep their ramen hot through the morning shift. They can’t bring the liquid into the clean room, so there’s a cabinet stuffed full of lunch-pails. This is the beginning of the assembly line. They’re in an even clearer environment because that’s where the screens are attached, and there’s nothing more infuriating than having dust under the glass, where you can’t get at it. My workspace is the blue rack. I put my laptop on the top shelf, and keep on the quality of the product from there. No room for chairs, so I stand between the rack and the wall. It’s not glamorous, but it keeps me near to Mr Liang and Mr Lee. Lunch-time! The first hint it’s time is that the line workers silently stand and quickly file out. The buzz of the line becomes deafeningly quiet in moments. Then Mr L or Mr Lee, whichever one is on duty, comes to find me. The line workers squat around the locker space, but the higher-caste engineers and managers eat just off-campus. We walk a block to their favored restaurant. I used to be asked to guide the order, but I defer, just recalling some of the dishes I’ve liked. I prefer to eat as they do, even (especially) when it’s striking or shocking. 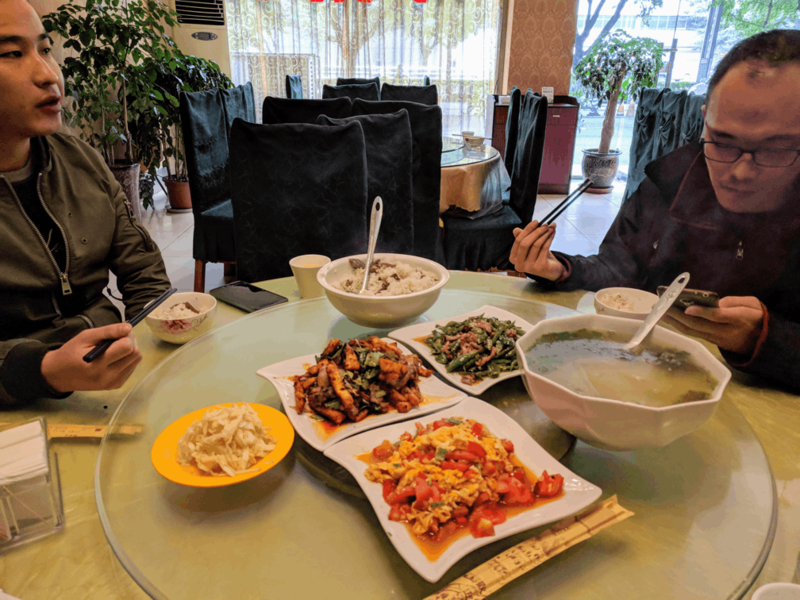 Now they never ask me when they order the food; they’ve learned I’m game for anything that’s not (1) terrifyingly spicy or (2) has lots of bones or gelatinous fat. The dish closest to you is eggs & tomatoes. Upper right is a pepper & pork dish, which pushed my limit. Often one of the dishes is spicy. In the middle is — wait for it — Chinese poutine! For real! It’s meat, veggies, sauce, and french fries (which are an adaptation of thinly-sliced scallion pancakes). There’s a bowl of cabbage, which I’ve never seen anyone touch, a medium bowl of white rice, and a huge bowl of soup, which is consumed at the end of the meal. Nobody seems to drink a beverage with the meal. I ask a lot of questions and mimic the order and style in which they eat; it amuses them. There’s way more food than we can eat, and I have no idea what happens to the tremendous amount of leftovers. 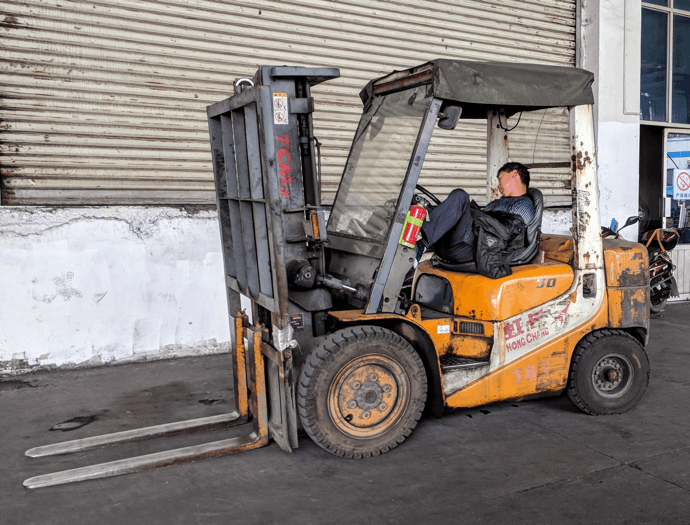 We head through the loading dock, where the boxes for the tablets are built and stacked on the right, and shipped out through the door at left. In the middle is the QA room, where I spend time when not on the line. That’s where we tackle on-going build issues, some of which are frankly unbelievable (and, because of non-disclosure agreements, can’t be shared in an open forum). Let’s walk into the QA room, where you’ll see the testers seated around two walls. 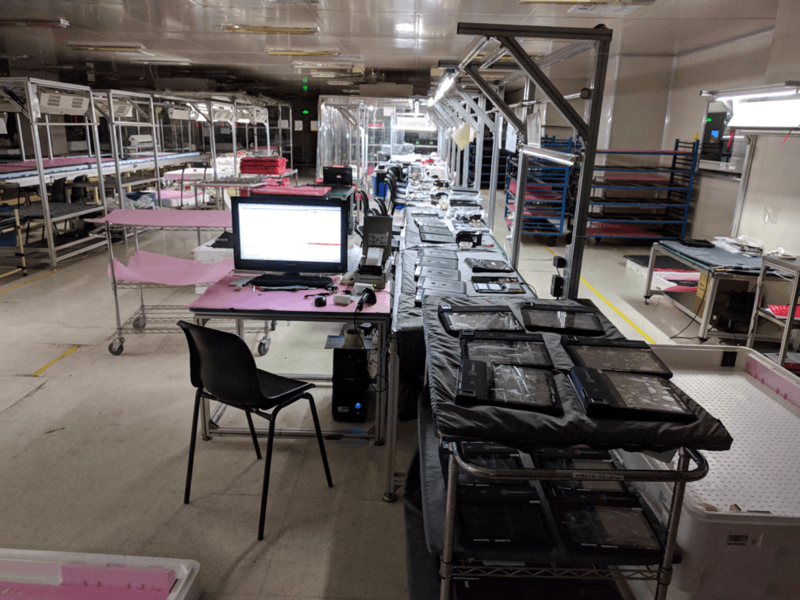 In the middle of the room are the tablets recently off the assembly line, and at way right are the devices that have passed, boxed into the brown boxes. By now several hundred have been assembled, tested, and boxed. It’s time to go. The now-empty delivery trucks are heading out, to be refilled with parts for delivery tomorrow. Groundhog day. Then it’s another hour-and-a-half commute back to ChengDu. A meal, a shower, and bed for a few hours. Repeat. This what I see most days. 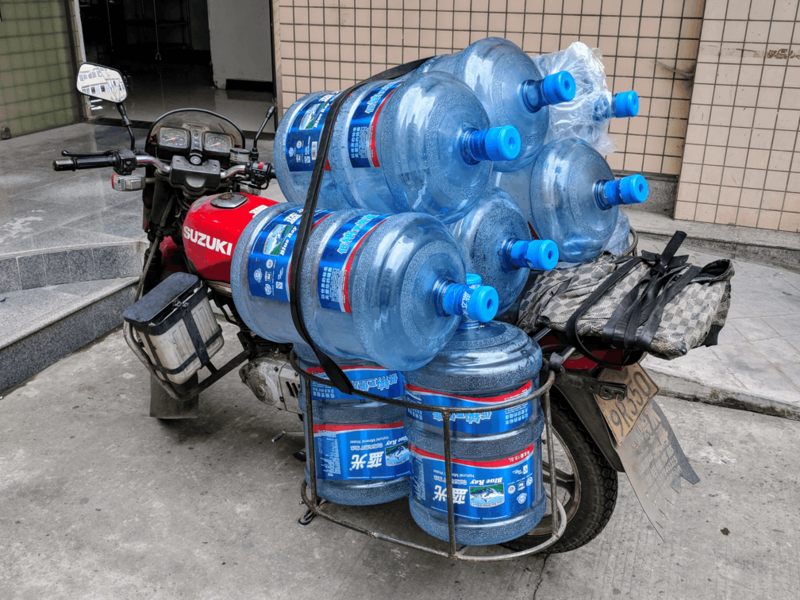 This was taken at 0736, in the middle of ChengDu. At left you see the WiFi with an ‘x’; connected but no Internet. Next to it is the leaning triangle, showing full cellular (“five bars”) but another ‘x’, no mobile data to the Internet. The phone is about as connected as a duck :-( Even when I’m connected, the data drops completely or is seriously degraded many times during the day. The true explanation is that China is 20 years behind the west, and there’s just a bit of cellular data coverage, darn little of it is 4G/LTE, as we’re used to. 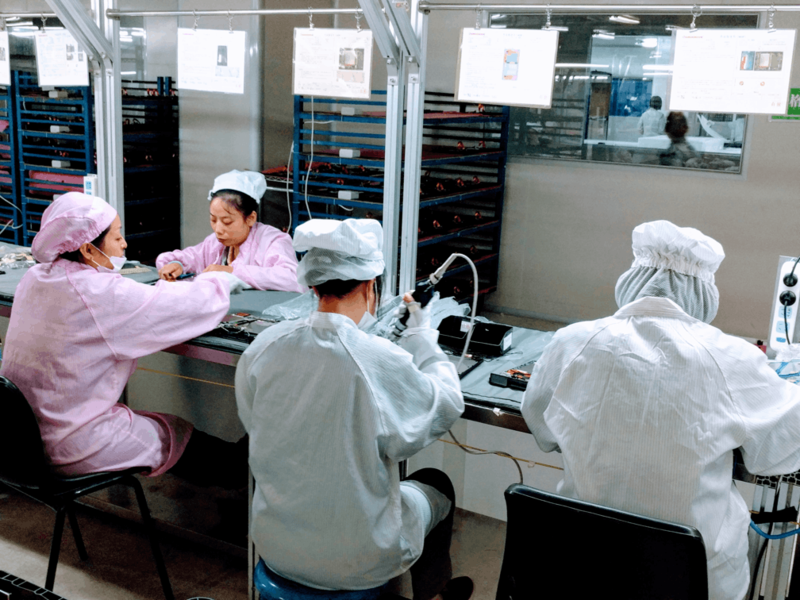 WiFi is also low-quality, and the factories don’t even pretend to provide it to the workers. Even worse, as the phone frantically thrashes, trying to find a robust network, it burns through the battery something fierce. It’s a running battle to preserve any battery at all. I keep my 20,000 MaH battery and cables on hand at all times. As I type this, at 02:30, the ‘net just went down. I can hear my VPN clicking every 5 seconds, trying to reconnect. After all this, I may not be able to get posted tonight. Sigh. Hoping I can get enough bandwidth to let this squeeze out.